Several recent events have made me step back and look at my career as a driver, and think about how amazed and humbled I am to be where I am. And at those times, I’ve been reminded just how many people it’s taken to get me to this point. There are so many of them. Some of them know how much they helped me. Some of them definitely don’t. I’ve never really taken the time to thank them publicly. I mean, I’ve thanked people at an awards show or after a race I’ve won, but I’m talking about a different kind of acknowledgement. Because the truth is that I’m not just thankful for these people when I’m winning. I’m thankful for them all the time. So I’m dedicating this blog entry to all of the people you’ve probably never heard of, people who have combined — in very different ways — to get me out of each hole and onto the next opportunity. This isn’t a complete list. There are definitely more people to thank, and I’ll probably write another blog entry about them one day. (And as you know, I’ve already written about some of the more well-known influences in my life, including Dale Earnhardt Jr., my crew chief Paul Wolfe and of course, Roger Penske.) I think you’ll enjoy some of these stories, too. These people were all links in the chain that brought me to now, and without them, I wouldn’t have made it. THERE PEOPLE WERE ALL LINKS IN THE CHAIN THAT BROUGHT ME TO NOW. My family didn’t have money for me to get started in racing, but my dad had a friend named Eddie, and Eddie had a son, Eddie Jr. His son raced quarter midget cars, which is kind of like the racing equivalent of tee-ball. Eventually, his son outgrew the car, and Eddie didn’t know what he was going to do with it. It wasn’t in great shape, so it wasn’t worth selling. Eddie did it. I was 14 years old. His car was my first ride, and I won my first six races. Without Eddie doing that, I would have never gotten started in racing. Eddie passed away about three years later. Picked up brain cancer and died right after it. I was only 17 or 18. He was a really close family friend. His son is still out there somewhere. I haven’t talked to him in probably 12 or 13 years. I’m kind of hoping he reads this. Without him and his dad, I wouldn’t have gotten started in racing. Whenever people ask me about how to get into racing, I think of Mark Turgeon. A lot of really great people in our sport started their careers by volunteering, almost like having an internship. In 2001, Mark was a full-time semi truck driver. He also loved racing. He volunteered to work for our family’s truck racing team. That relationship grew to where he got a job with my family, but when my family’s team went out of business, there was probably a three or four-year lull where he wasn’t really associated with us. I called him up when I made it to Cup, and asked him to drive my traveling bus, which goes to every race. He’s been with me ever since. On the road, the bus driver turns into more than just that. He’s an assistant who helps with just about everything, and a lot of those things are thankless. I’m thankful that Mark’s a part of my team. George and Judy McCord are friends of my parents. They’ve known my family for 20 or 30 years. My dad knew George because he was a retired driver and racing enthusiast. George wanted to be involved in the sport, and since he didn’t drive anymore, he had to find another way. In 2002, when I couldn’t really afford to race, he gave me my first late model ride. I’m dedicating this blog entry to all of the people you’ve probably never heard of, people who have combined — in very different ways — to get me out of each hole and onto the next opportunity. It was a red and white car with Dodge written all over it. The truth was that I didn’t do well in it. I was never super successful at the late model level. But it helped me gain experience to become successful. John Conley gave me an ARCA ride in 2006. 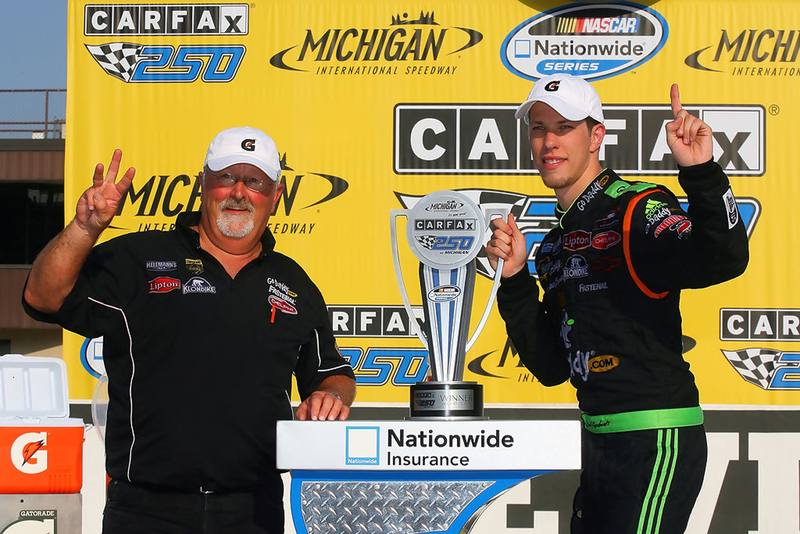 It was a one-off race in Michigan. In life, you don’t get a lot of opportunities to show who you are. In that particular case, I failed miserably. I was terrible — so awful that I literally never heard from the guy again. It’s been almost 10 years now. But I learned a few really big things that weekend, driving his car, that put me in position to take advantage of the opportunities I would get over the next year. So that was pretty significant. In 2006, my family’s business went under. Basically, I had no job, and no idea what I was going to do for the rest of my life. I went to a racetrack just to be there, and Sutton Motorsports needed a spotter for their truck team. They said they’d pay me $200, and at that time, $200 was a lot of money to me. So I jumped all over it. Kelly Sutton, the daughter of the team’s owner, was the driver. I spotted for her probably half a dozen races, and somebody wrecked her at Kansas pretty badly, and she was hurt. After that, the team put me in the truck. I only think I drove two races. At Kentucky, we ran really well, but we broke something. Then the next race, we went to Memphis and fought right up towards the front. I don’t remember where we finished. It was something very respectable. But what I learned in that race would play a huge role in shaping my future. Gary was the crew chief for Sutton Motorsports, and he started working with me when I joined the team. He was the first crew chief I’d ever worked with besides my dad. He also recommended me to other team owners when Sutton Motorsports shut down. In Madden, the football video game I play, there’s a game mode where every player starts out with a confidence score of 50. It’s on a scale from zero to 100. If you play really well, you gain one or two points. If you play really poorly, you lose five or 10 points. When it’s all said and done, the confidence adds up, and it makes your other ratings better, too. Racing is very much the same, except you start with zero confidence. That’s where I was when I met Gary in 2006. My family had just lost their business. I didn’t necessarily believe in who I was as a race car driver, or a lot of the things I was doing. Gary believed in me. The confidence boost he gave me helped me become a better driver. So it was pretty significant for me, mentally, to have worked with him. That was one of the catalysts I needed at that time in my life. 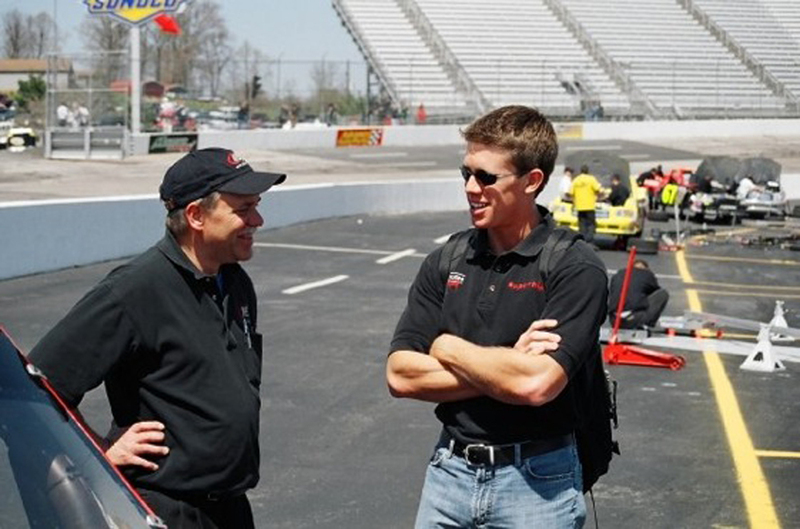 ONE OF RACING’S UNSUNG HEROES, MIKE MITLER, AND CARL EDWARDS, ONE OF MANY DRIVERS (MYSELF INCLUDED) HE HELPED GET STARTED. As far as years go, 2006 was about as rough as they come. Mike Mitler was another person who helped me get through it. 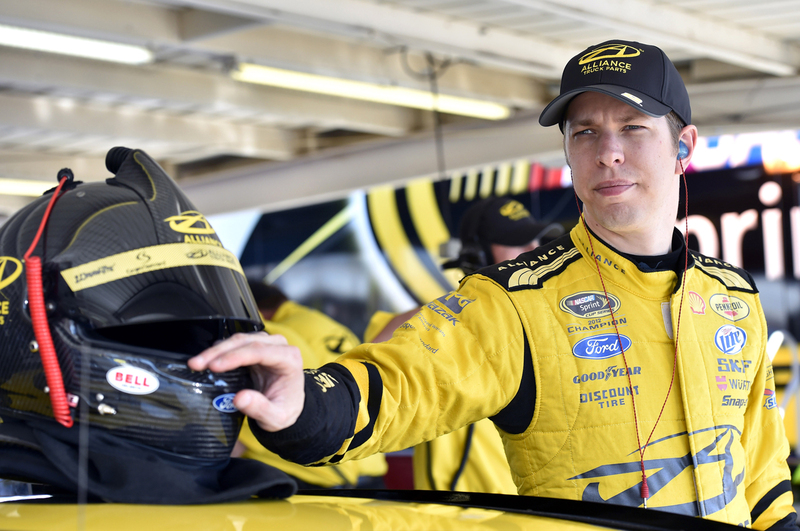 I drove for his truck team, and that experience helped me get to the next level in my career. Mike has a whole other really successful business outside racing, which makes his impact in racing even more amazing. He’s one of the unsung heroes of our sport. He’s helped a lot of drivers besides me get their careers started: Rusty Wallace, Carl Edwards and Jamie McMurray, just to name a few. Mike also gave me a place to live, which I didn’t have at the time. I lived in a hotel room outside his race shop in St. Louis for somewhere between three to six months. It was one of the greatest times of my life. One of the drivers of the Germain Racing team got suspended in 2007, and they needed someone to drive for them. Todd Bodine, who was a race car driver, and Mike Hillman, who ran their team operations, got together and tried to find a replacement. They called Mark Martin, but he was toward the tail end of his career, and declined. The next person they called was me, and sure enough, they put me in. It was kind of a leap of faith, and it was only for a single race: the O’Reilly 200 at Memphis. When I met him online in 2004, T.J. was just some guy I was racing in a video game. When you race online, there’s always a chat session before and after, so we got to talking. Turned out he worked for a race team called MB2 as mechanic, and he just happened to love racing online like I did. So we got to know each other that way. By 2007, T.J. and I were distant friends. Right about that time, I got my opportunity to drive the truck at the O’Reilly 200 at Memphis for Germain Racing. T.J. was working for JR Motorsports at that point, and he and Dale Jr. were watching the race together. Dale was unhappy with the driver for his Xfinity team (it was the Busch Series at the time), and was looking to replace him. As legend has it, T.J. bet Dale that I would run really well in the race, and I did. I led it for nearly two-thirds of the way before spinning out late, and finishing 16th. Not long after, I had a ride at JR Motorsports. Dale put T.J. in charge of making sure that I didn’t screw it up. I moved into a guesthouse next to T.J. that Dale Jr. owned. T.J. and I were friends already, but we became even closer. I had just moved from Michigan to North Carolina. That was a big move for me. I didn’t know where I was. I didn’t know anybody on the race team. He helped me keep my sanity and fit in. He had my back in a lot of ways. Without T.J., I honestly don’t know if I would have ever made it in my career. Today, as you probably know, T.J. is Dale Jr.’s spotter. We’re still good friends. He’s probably my best friend. Tony Eury Sr. was my crew chief at Junior Motorsports. Before that, he was Dale Earnhardt’s crew chief at the Xfinity level, and Dale Jr.’s at the Cup level. So he was someone who had a lot of great stories, and gave me a lot of perspective on the sport. He helped me make the most of my opportunity. He commanded respect, not just for himself, but for me, at a time where I hadn’t earned any. He put me in a position of strength that got me to where I am today. Pops is retired now. He earned it. But some days, I wish he was still on my team. HAVING TONY EURY SR. AS A CREW CHIEF WAS AN INVALUABLE PART OF MY CAREER. So I met with them. I really liked John’s style and his firm. At the time, I was signed to drive with Hendrick Motorsports, but John encouraged me to meet other teams, just to keep my long-term options open. One of the teams was Team Penske. When Hendrick decided to part ways with me in 2009, John’s foresight proved really important. Without him, I wouldn’t have know where I was headed next. Because of him, I wound up driving for a racing legend. John probably saved my career. So there’s Roger Penske, and then there’s Walt, Roger’s right-hand man. Both of my grandfathers died when I was too young to remember them, so I never really knew what it was like to have one. But if I had a grandfather, I kind of imagine that he’d be a lot like Walt. Walt has an amazing personal touch, and everyone who works with him is lucky to do so. When Roger has something to tell me and I’m having trouble hearing it, Walt does a great job making sure that I listen. 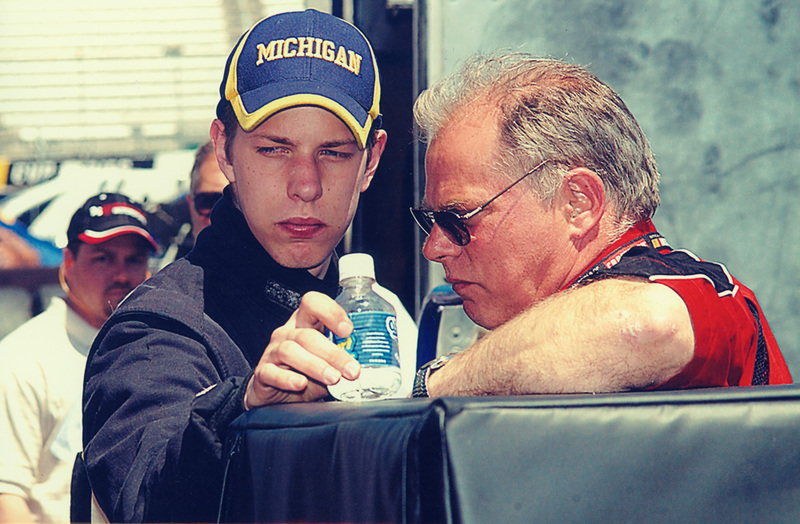 He’s played a big part in my success during my time with Team Penske. When I crashed at Road Atlanta in 2011, that injury could have ended my career. My body was a wreck. Dr. Ryan Robinson, the chiropractor who took care of me afterward, not only kept that incident from ending my career. He showed me how to recover from it, and how to the make the most of it in terms of taking care of myself physically. I still feel the effects of that crash every day, and his work gets me through it. Dr. John Melvin, who passed away last year, was the head of safety at NASCAR. He was from Michigan, and he had his job for the past 12 or 13 years. He came to help specifically with one of my cars in 2007, and pointed out numerous safety flaws that I needed to fix with my safety equipment. We made them. Right after that, I had a major accident at California Speedway. I’ve posted the video here. It was really, really bad. Without his safety equipment and guidance, I’m fairly certain I would have died. My mom and I are really different. But one of things I appreciate about her was simply that she was there to do all the things that moms do. Times were sometimes very tough for us growing up. We didn’t have a lot, and with all the comings and goings that go with racing, there were a lot of things about our lives that were up in the air a lot of the time. There wasn’t a lot of normal. She handled all the normal things that helped us develop into people, and I’m grateful for that. My mom’s other claim to fame is that she was my first spotter. She worked my first race for K Automotive at Martinsville in 2004. She was pretty good, actually, on par with your average Cup spotter. And she’s very likely the best spotter of among moms of Cup drivers. My father taught me a lot of things, and I wrote in depth about our relationship last Father’s Day. He taught me what it meant to have a work ethic. He taught me about being passionate, not just towards what you do, but also about other people. He taught me about morals and having a code of conduct, and treating people around you the right way. The skills he taught me are ones that still shape who I am every day. THE THINGS I LEARNED FROM MY FATHER ABOUT RACING AND ABOUT LIFE HAVE SHAPED ME INTO THE PERSON I AM. How can I explain my uncle? My Uncle Ron taught me a lot of the hard-nosed attitude that I have today. My dad can be a bit of a softy, but my uncle is not, by any means. Uncle Ron is a military vet, a take-no-prisoners guy. So from that angle, he taught me that side of life. He taught me that sometimes, you need to yell, scream, and stand up for yourself. He also taught me a lot about racing. Last year after Texas — after everyone on Jeff Gordon’s team wanted to punch me (and one guy did) — my older brother, Brian, was really angry. Brian toughened me up in a lot of ways I always needed, and because of him, I can honestly say that not one punch at Texas phased me at all. All my siblings played a role in who I am, but my sister, Dawn, was the closest to me age-wise. She was my babysitter growing up, even when she didn’t want to be. She’s always had my back, and she still works with me today. My oldest sister, Ginger, taught me pretty much everything I know about computers and technology. Our first computer was the computer that she went out and bought. That’s how I learned to use a computer. I literally didn’t know how to use the Internet until she showed me. I wouldn’t have made my way to Twitter (or these blogs) without her. Kathy, my middle sister, had a family when I was still little. When she had kids, I was the godfather. She taught me a lot about family in ways I didn’t even really think about then. When you have a sibling who has kids, you learn a lot. The only reason I have any clue about what having a baby will be like is because of what I learned from her at a very young age. I only knew one grandmother, my dad’s mom, and she was very involved. She partially raised me growing up because my family was gone so much. She’s the one who always took me to church. She taught me to be a spiritual, giving, passionate person by her example. She was always doing charity, and in some ways, she’s an inspiration for my foundation. She lived very frugally, and taught me a lot about what you really need to live versus what you want to live, and the difference between the two. In many ways, she was almost like a second mom to me. She passed away in the spring of 2006 (what an awful year). Sometimes, I wonder what she would think of me now. Last but certainly not least, there’s my girlfriend, Paige. Paige was the inspiration for starting this blog. I’m not a great communicator, but she encouraged me to use the format to tell my story. It’s allowed me to connect with people in ways I never imagined. I couldn’t be more grateful to her. Someone said once that we’re all products of the people around us. I’m so lucky to have had the help and guidance of the people in my life. I can’t imagine how I would have gotten here without them — especially when there are still times I can’t believe I’ve gotten here at all.